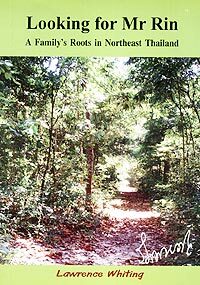 “Looking for Mr. Rin, A Family’s Roots in Northeast Thailand” is published by Falling Rain Publications, ISBN 978-463-419, and is printed in Ubon, written by Lawrence Whiting. Author Whiting is a British expat, who had married one of the eight daughters of Mr. Rin and his wife Yai Hom. Mr. Rin, it turns out, was a native of Phana, a small province in north-eastern Isan, and the author soon saw that his chronicle of the family he had married into was also the chronicle of the life (and times) of the patriarch Mr. Rin Mahanil, a teacher and small farmer. Further on in the book, he shows historically the ethnicity that holds the Isan people together with the Laos peoples, following the ceding of much of the region to the French in 1893 (to form French Indo-China) and the need for King Chulalongkorn to then consolidate “Siam” as one country and not a collection of vassal states. Much of this is then expanded upon in the writings done by Mr. Rin throughout his long life. The book gives a very detailed account of not only the lives of an Isan family, but also Isan ceremonies and rituals, including the cremations of Mr. Rin and his wife. “Looking for Mr. Rin” is available at most good bookshops with an RRP of B. 550, though copies can also be purchased directly from the author through the contact email [email protected] For those expatriates who are married to an Isan lady, this book will undoubtedly mirror their own experiences of marrying into a Thai family (make no mistake, they do not marry into the husband’s family to the same extent), and also perhaps go towards explaining the seemingly complex cultural mores that the Lao-Thai possess. It held my attention all the way through, and I found it to be insightful as well as entertaining. A good read. The Shoe Fairy (Robin Lee, aka Yun Chan Lee) 95 Min. Director of the current My DNA Says I Love You, this earlier film of hers is a candy-colored modern-day Chinese yarn similar to “The Little Mermaid.” Narrated by Hong Kong superstar Andy Lau, the story centers on a young girl in a wheelchair who grew up listening to fairytales. After an operation on her feet, she grew into a beautiful young woman with a passion for shoes - which causes problems with her husband. For the sake of domestic bliss, she gives up buying shoes - but then she finds she can’t walk any longer. And her shoes are very unhappy. Taipei’s Bohemians: The Life of Theater 55 Min. Documentary on a group of theater artists in Taipei. Grandma And Her Ghost (Shaudi Wang) 80 Min. A 5 year old boy moves to live with his grandma in a small town in Taiwan. Soon after, he discovers that his grandma is not only a vendor, but also good at catching spectres. One day, she comes to realize that her grandson has mistakenly released some of the ghosts and demons in her house, some almost pitiful, some quite threatening. A colorful, funny, and enchanting animated film, distinctly Taiwanese in its use of folk beliefs. The Last Rice Farmer: Let It Be (Lang-Chuan YEN) 110 Min. Documentary on the lives of three elderly rice farmers. Fishing Luck (Tseng Wen-chen) 96 Min. A light romantic tale set on picturesque Lanyu (Orchid) Island, off the southeast coast of Taiwan, and inhabited by the Tao race, descended from Filipinos. Impressive scenery. The Rhythm in Wulu Village (Wang Chung-Shung) 75 Min. 16 mm images and music infuse this documentary about Taiwan’s indigenous Bunun people, focusing on the Wulu village where much effort is being spent on education, especially the Bunun language, music, and weaving, to preserve this traditional culture. Three Times (Hou Hsiao-Hsien) 132 Min. Variety: Synthesizing Hou Hsiao-hsien’s ambivalent relationship with time and memory, Three Times forms a handy connecting arc between the Taiwanese director’s earlier work and the increasingly fragmentary direction of his recent films. Best appreciated by those familiar with his slow rhythms and pessimistic take on contemporary life, this film presents three stories using the same leads set in three time periods to explore love and how the present circumscribes lives. The periods chosen - 1966, 1911, and 2005 - have resonances in Hou’s psyche. The first, “A Time for Love,” matching the director’s youth, takes on a relatively linear narrative with well-defined characters, reminiscent of his earlier autobiographical works; the segment hinges on the meeting of a soldier boy (Chang Chen) with a pool hall hostess (Shu Qi) and his subsequent search for her. Second episode, “A Time for Freedom” set in a kind of upscale brothel, represents his attraction to the past, with Shu essaying a courtesan tending to Chang during the Japanese occupation of Taiwan. Third episode, “A Time for Youth,” set in present-day Taipei, is the bleakest, as to be expected from someone continually prodding at the disorder at the heart of contemporary Taiwanese life. Tale here centers on an epileptic singer (Shu) who casually takes up with a photographer (Chang) while increasingly ignoring her female lover. The Chocolate Rap (Chi Y.Lee) 83 Min. Spectacular breakdancing and nice music, with a slight story based around dance and the theme of teenagers coming of age and finding their identity, and about peer pressure at a young age. The film celebrates street life, and street dancing in particular. Good soundtrack and visuals. Tuesday, February 5 13.00 - 14.35/14.30 - 16.30 The Shoe Fairy (Robin Lee) 95 Min./Taipei’s Bohemians: The Life of Theater 55 Min. Wednesday, February 6 13.00 - 14.30/14.40 - 16.30 Grandma And Her Ghost (Shaudi WANG) 80 Min./The Last Rice Farmer: Let It Be (Lang-Chuan YEN) 110 Min. Thursday, February 7 13.00 - 14.30/15.00 - 16.25 Fishing Luck (TSENG Wen-chen) 96 Min./The Rhythm in Wulu Village (WANG Chung-Shung) 75 Min. Friday, February 8 13.00 - 15.15/15.20 - 16.43 Three Times (Hou Hsiao-Hsien) 132 Min./The Chocolate Rap (Chi Y.Lee) 83 Min.